I wish I had my wedding pictures already. I realize my wedding isn't until June but I just know that the wedding photos I will have of these hangers are going to be so much better than mine. I mean...isn't most of the point of these super cool hangers that they're adorable in photos? Pretty sure it is. 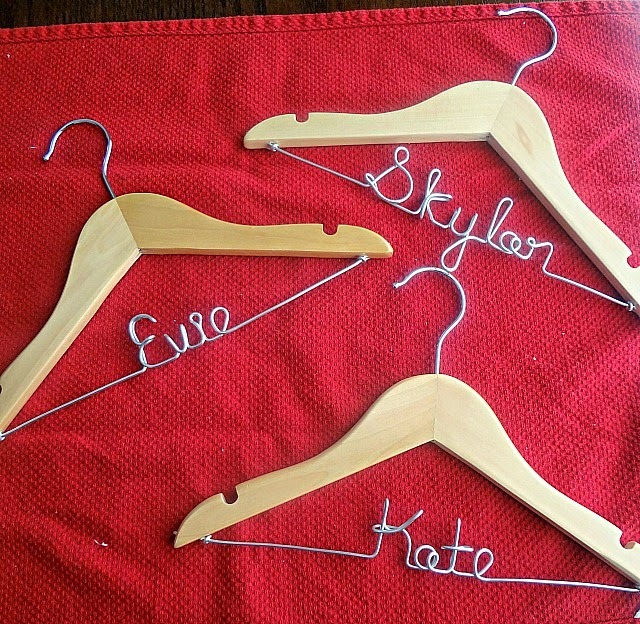 In case you've never heard of this concept: it is a current trend to have personalized hangers for the bride and/or bridal party with names (or titles etc. --such as "Bride") bent into wire for the hangers, and sometimes something engraved on the hanger itself-mostly to be used as a photo prop (not to say that dresses can't hang from them--they can and they do. Just so long as they hang from the sturdy hanger and not the soft, bent, wire). I was lucky enough to receive personalized hangers for myself and my gals from the makers of the original bridal hanger--Amy's Original Bridal Hangers! Ok--let me explain the options you have when ordering these hangers. First of all-they make childrens' hangers, which you see, above, I got for my 3 flower girls. First you get to choose what color of wooden hanger you would prefer. For most hangers you have the option of white, black, blue, natural light wood (what all of my hangers, excluding the one I got for myself, are), or brown wood-which is the color of the wood on my hanger (there are a couple exceptions where you could choose cherry stained wood, distressed wood, etc.). Next you decide whether you want the wire kind of hanger or just engraved (you do have the option to do both as well!) Some engraved hanger options include a heart with your and your fiance's initials, your wedding date, bridal party position (ie Maid of Honor), your and your fiance's names...etc (and the engraving could be positioned in the center and/or on the arms of the hanger, or whatever really.) On my bridal hanger I have "Kayle and Michael" on one side and "June 20, 2015" on the other. If you do decide you want the wire you have some more options here, as well. You can just have a monogram (so in my case that would just be a "C" for my future last name). You can just say what your title is (Bride, Mother of the Bride, Bridesmaid, etc.). You can have a heart. You can have hearts in conjunction with some of these other options. It can say, "I do" or "Mrs". You can have a first name (like I did for my bridal party-Alexandra, Shannan, etc.) 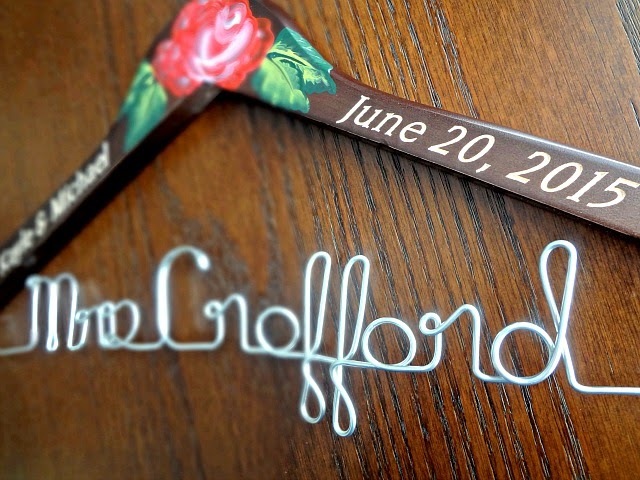 Or, like for my hanger, it can say your new married name ("Mrs. Crofford"). There are probably some other options too-like I said...customizable...but you get the idea. Most of the hangers automatically come with a bow made of ribbon (I requested mine without but you can do whatever your heart desires)--choose what color ribbon you want. Simple enough. Extraaaas! You can add a full-on monogram to the center of your wooden hanger (where it has the first initials from your and your fiance's first names on either side and the middle letter is the first letter of your married last name. So for me that would be MCK.) As we discussed earlier you can add engraving to the hangers. 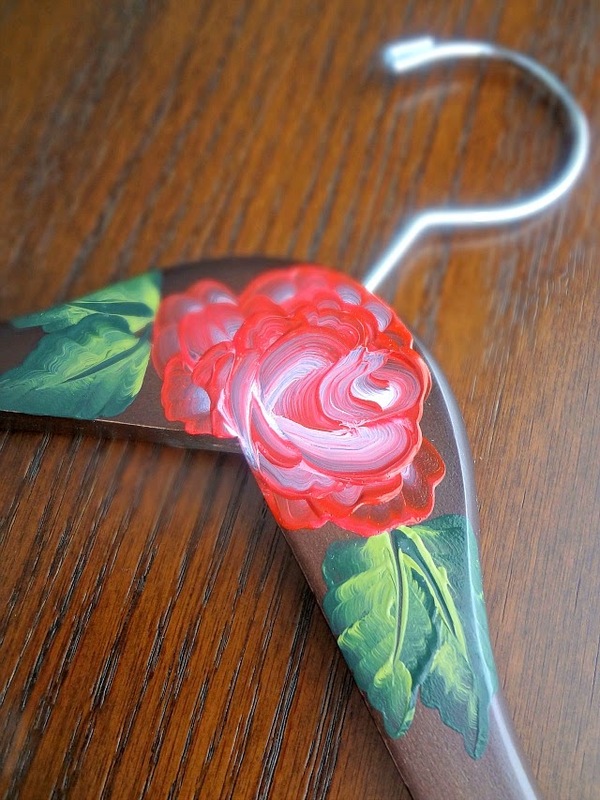 And then there's my personal favorite--Amy will hand paint a gorgeous flower in the center of the wooden hanger for you. I, obviously, requested a red rose which is probably my most favorite thing in the whole world. But, as you can see on this page, she's painted various kinds and colors of flowers so just send her a request and she'll do it! It's a perfect way to incorporate your wedding flowers in a creative way. So...yeah. I got 5 hangers for my bridesmaids that say all of their first names. I got 3 child hangers for my flower girls that say their first names. 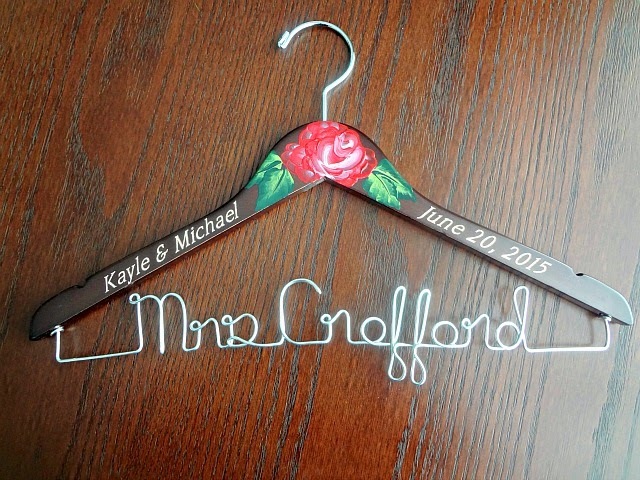 And I got myself an engraved hanger, with a painted red rose, that says "Mrs. Crofford" and I'm crazy excited about it! The hangers for the girls are part of their gifts for being in the bridal party and I highly suggest them as an awesome (fairly inexpensive) gift idea! To find out more about Amy's Original Bridal Hangers check out her Etsy shop and website to keep up to date (you never know when she'll run a sale-currently their hangers are 20% off!) on twitter and facebook. Disclaimer-I received complimentary personalized hangers from Amy's Original Bridal Hangers (minus the cost of shipping) to facilitate this review-I was under no obligation to write a positive review and all opinions are, as always, my own.